ASK THE COMMISSION: What's the deal with illegal events? What is considered an 'illegal' event and what happens if I participate in one? This is an issue that I have been dealing with since I started in 2008. I am essentially an office of one, so it can be extremely difficult trying to educate the entire state of Minnesota on the rules and regulations that pertain to combative sports. Because of this, I sometimes come across venues that hold events without a regulatory body, even though the law requires that one be present. In some cases, it's because the venue, or promoter, is unaware of the statutes pertaining to combative sports. Other times, it's a venue or promoter that knows the regulations, but thinks they can sneak in under the radar and then later claim they were unaware of the statutes. Unfortunately, ignorance does not exclude you from the law. State statute says that the Department of Labor and Industry (DLI) regulates all professional boxing, amateur and professional mixed martial arts (MMA), and amateur and professional toughperson contests in Minnesota. I'm going to assume that everyone reading this knows the definition of boxing and MMA, but what about toughperson? State statute defines a toughperson contest as "contests marketed as tough man or tough woman contests, means a contest of two-minute rounds consisting of not more than four rounds between two or more individuals who use their hands, or their feet, or both in any manner. Tough person contest does not include kickboxing or any recognized martial arts contest." So you're probably saying, "But Matt, I'm not competing in toughperson contests, they are 'amateur boxing' contests and that's not something DLI regulates." for an "amateur boxing" event, I will contact USA Boxing and ask them if they are regulating the event. USA Boxing has very strict requirements for holding and competing in their events. If they tell me they aren't regulating it then I will do some more research on the event to determine if it would fall under the definition of a toughperson contest or an amateur boxing contest. If it falls under the definition of a toughperson contest then I notify the venue and local PD that they are promoting an illegal event. If it falls under the definition of an amateur boxing event then I notify USA Boxing of the event and they take over. So what are the repercussions should you choose to participate in an illegal event? According to Minnesota Statute 341.32 Unlicensed Events; Misdemeanor: "Any person or persons who send or cause to be sent, published, or otherwise made known, any challenge to fight what is commonly known as a prize fight, or engage in any public combative sport match or contest, with or without gloves, for any prize, reward, or compensation, or for which any admission fee is charged directly or indirectly, or go into training preparatory for the fight, exhibition, or contest, or act as a trainer, aider, abettor, backer, umpire, referee, second, surgeon, assistant, or attendant at the fight, exhibition, or contest, or in any preparation for same, and any owner or lessee of any ground, building, or structure of any kind permitting the same to be used for any fight, exhibition, or contest, is guilty of a misdemeanor unless the licenses required for the holding of the fight, exhibition, or contest have been issued by the commissioner in compliance with the rules adopted by it." In addition, Minnesota Statute 341.355 Civil Penalties states, "When the commissioner finds that a person has violated one or more provisions of any statute, rule, or order that the commissioner is empowered to regulate, enforce, or issue, the commissioner may impose, for each violation, a civil penalty of up to $10,000 for each violation, or a civil penalty that deprives the person of any economic advantage gained by the violation, or both." What this basically says is that the venue, promoter, fighters, corners, officials, etc., are subject to a misdemeanor charge and up to $10,000 fine for each violation. If you are licensed by DLI, you are also subject to a suspension, revocation of license, or denial of license. Because all of the regulatory bodies work as one under the ABC banner, this could also affect your ability to fight in sanctioned events within other states and tribal jurisdictions. "There is just too much risk involved in those types of events. If you're untrained and possibly facing someone that is trained, you could end up seriously injured. In most cases, you can't just walk off the streets and safely defend yourself against a trained athlete. Even if you're facing another guy that isn't trained or is at the same level, these kinds of events are put together to make a few bucks and the promoter couldn't care less about your safety. I personally think these events give the sanctioned events a bad name. A lot of people can't tell the difference and if you just throw in a bunch of guys off the street inside a ring or cage, chances are it's going to be very sloppy with guys gassing out and therefor make people think all events are like that. It's just overall bad for the sport. I think licensed fighters should stay away from these events. A licensed fighter competing against some guy out of the crowd is just too dangerous. Not to mention the fact that these guys could have dirty or infected blood and could potentially give you something like hepititis and then you wouldn't be able to compete legitimately anymore." "I used to think that being involved in unsanctioned or illegal events wasn't a big issue until I started attending more and more events, both sanctioned and unsanctioned. After a while, I started to notice the real differences between sanctioned fights and these so called tough man competitions. Differences like guys having to fight multiple fights in a night with no experience doing so, no doctors on site to check on the safety of competitors, etc. I think that overall, these events may not be the worst thing in this sport, but how safe do you really feel knowing that there is NO ONE to oversee the safety and well being of each fighter? I have been to more then one show where the guy reffing the fights was so drunk by the end of the night, that his words were starting to slur together. Just all around, a bad idea for the fighter. A quick buck is not worth the potential risk of losing a fight license or possibly getting seriously injured due to lack of proper supervision. It would make me very upset if I discovered one of my fighters went behind my back and participated in an illegal event. I take pride in the advancements and strides that have been made throughout the state of Minnesota in MMA and combative sports in general. I'd hate to see these guys throw everything away and potentially get suspended from an upcoming (sanctioned) event because they got caught doing an unsanctioned event prior to it. Even worse would be to get hurt in the unsanctioned event and then be forced to pull out of a sanctioned fight they had already agreed to." 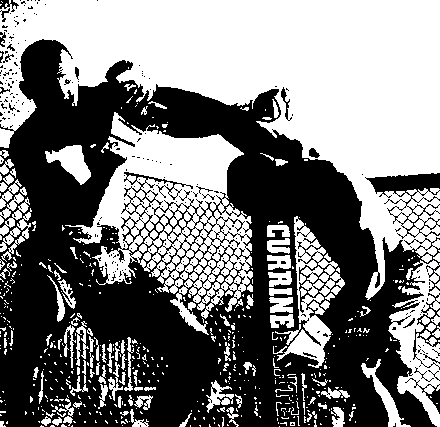 Everyone has to make their own decision on how they want to pursue their fight career, but you should also be informed as to what the consequences are for participating in events that are unsanctioned or illegal. The best decision you can make is to do your research. Don't just assume that because someone is advertising an event it means that it's legit. If you aren't sure then ask around the gym or give our office a call. I'm always willing to answer any questions you may have.